KUALA LUMPUR: China’s most famous painting “Along the River During the Qingming Festival” (Qingming Shanghe Tu), dubbed “China’s Mona Lisa”, will be showcased in the form of dough art figurines at the Starhill Gallery from tomorrow to Saturday. The first-time display of this 18m-long Chinese creation in Malaysia will be the highlight of “The Enchanting Orient” exhi­bition jointly organised by Starhill and Han Culture Centre Malaysia. The dough creation is based on the celebrated master work of Song Dynasty’s imperial court artist Zhang Zeduan (1085-1145), which depicts the daily life of people then and the landscape of Bianjing (today’s Kaifeng in Henan pro­vince). The original Song piece is now kept in the Palace Museum in the Forbidden City in Beijing. Regarded as China’s national treasure, the silk scroll painting measuring 5.25m x 25.5cm features a river meandering from countryside through to a busy city. The painting captures, amidst the hustle and bustle of life, the various expressions of 814 people from all walks of life and 60 animals. Also included are 28 boats, 30 buildings, 20 vehicles, eight sedan chairs and 170 trees. According to Wikipedia, the artwork was revered by empe­rors and court artists of subsequent dynasties had gone on to reinterpret it. The scroll went through seve­ral private hands before returning to public ownership. The painting was a particular favourite of China’s last emperor, Puyi of Qing Dynasty. The Qing version is now in the Taipei Palace Museum. The show also features other paintings, porcelain creations and calligraphy of local artist Prof Dr Cheah Thien Soong whose works will be exhibited until July 24. 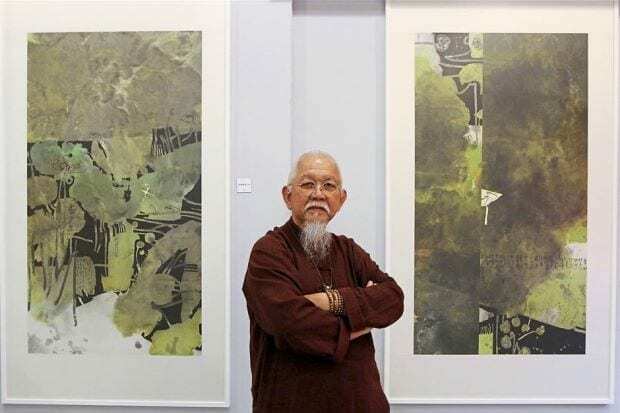 The 74-year-old Malaysian from Negri Sembilan is consi­dered the second-generation Nanyang-style contemporary ink-painting artist. Dr Cheah, who has won numerous awards from art institutes in Malaysia, Singapore and Taiwan, said his works that would be displayed consist of a series of lotus flower paintings, Chinese calligraphy and pottery he had created in China’s porcelain capital, Jingde­zhen, in Jiangxi province. This entry was posted in 新闻 and tagged 艺术, 草堂门.